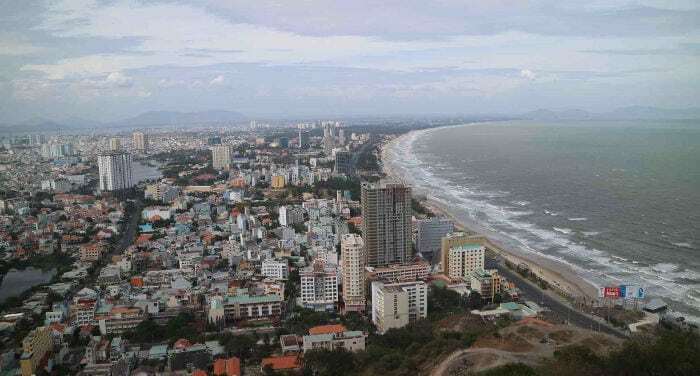 About 125 kilometers South of Saigon is the seaside town of Vung Tau, at the tip of a peninsula separated from the main land by the Co May River. It is very popular with locals at weekends and holidays, being so close to Saigon. There are buses from Tan Son Nath airport, and mini vans that leave every 15 minutes from Mien Dong bus station. The journey takes around 2 hours, and the mini van will drop you at any hotel or Guesthouse in Vung Tau. It is a good idea to get the phone number or business card of the driver, so that when you want to go back to Saigon, you can ask to the receptionist of the hotel where you stay to call the driver. The mini van will then pick you up at your hotel, at the time of your choice. There is also a boat that leaves from Bach Dang Pier, located in Saigon’s District 1. Note that the boat is a bit more expensive (around 200,000 VND). There are hotels and lots of guesthouses in Vung Tau. They are very low priced, you can get room with fan for as little as 50,000 VND. Weekends and holidays will be a bit more expensive, with pricing starting at around 200,000 VND. Click here to check out the best hotels in Vung Tau.